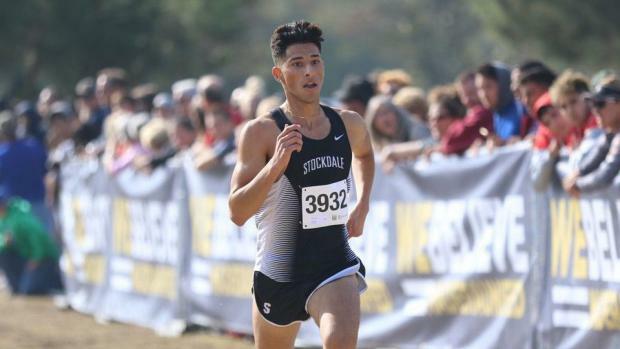 Stockdale senior Marcus Mota won his second title in as many years and Buchanan junior Corie Smith won for the second time in three years on Thursday at the CIF-Central Section Championships held at Woodward Park in Fresno. Mota and Smith both won Division I titles over the 5K Woodward Park course that is also used for the CIF-State Championships. Mota (DeAnna Turner photo above) crossed the line in 15:25.90 to edging Damian Gavilan of D-I team champion Paso Robles by 1.36 seconds. Isaiah Galindo of team runner-up Clovis North is third (15:38.57). He was the runner-up to Mota last year by 10.40 seconds. Paso Robles went 2-4-8-14-37 for 65 points, seven better than Clovis North. Buchanan had 85 for third in the team chase. Smith, the defending D-I state champion, crossed in 17:15.10. She also won as a freshman and placed second last year to senior teammate Meagen Lowe, who was second this time (17:32.75). 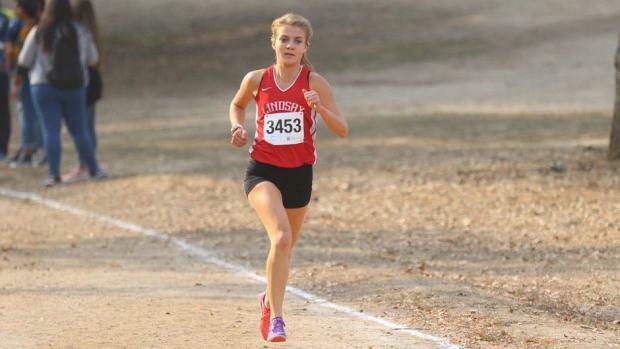 Smith and Lowe, who train on the Woodward Park course, went 1-2 at 2017 State Final. McFarland's Hilda Gonzalez (18:27.89) was third with Clovis' Olivia Herrera (18:33.40) fourth. Buchanan got a 1-2-5-7-9 finish to win its third consecutive D-I team title. Clovis West with 92 points was a distant second. Kelly Brewer was seventh overall for Buchanan, putting up the meet's top overall time among junior boys. Other Buchanan runners putting up class-best times: Lowe (senior girls), Smith (junior girls), Morgan Hutchinson (sophomore girls) and Kaylee Elliott (freshman girls). Unique Ford (Madera) crossed first a head of a trio from team champion San Luis Obispo: Grace Rubio, Shaylee Grimm and Grace Greenelsh. Ford finished in 18:50.37 with Rubio 28 seconds back. SLO, running in the CS finals for the first time after 13 Central California schools shifted from the Southern to the Central section over the summer. Xavier Gonzales (Atascadero) was a narrow winner over Jacob Resendez (Bakersfield Liberty). Gonzales hit the line at 15:46.81, just 0.34 ahead of Resendez. Monache senior Ivan Mendez, runner-up last year, was third here in 15:49.99. Bakersfield Liberty won the team title going 2-5-9-11-21 for 48 points to beat San Luis Obispo by 12 points. Alex Cuevas (Ridgeview) edged teammate Bryan Gaxiola by less than two seconds leading a 1-4 finish as Ridgeview ran away with the boys team title. As expected, the girls race came down to the same two from last year. And the 2018 results were no different with Sunnyside junior Jessica Valles defending her title and Wasco senior Sayra Raya crossing in second. Valles' winning time of 19:21.86 is about an eight-second drop from her 2017 winning time. Raya crossed in 19:39.80 with Fresno Hoover's Yorkabel Gebrehiwot third in 19:47.70. 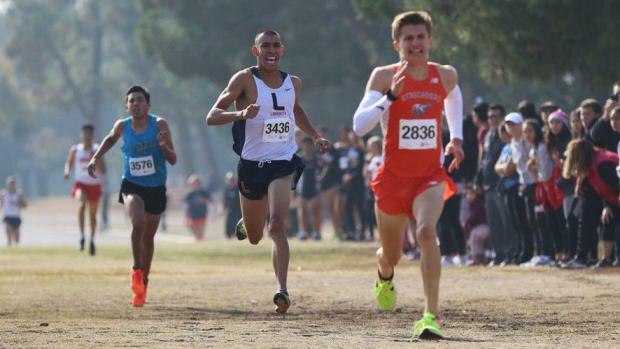 Cameron McFarlin (Coalinga) was the boys winner (16:45.31) with Victor Chavez (West Bakersfield) second in 16:53.99. Victor Cisneros (Lindsay) was third in 17:05.22. The girls race produced the same finish as 2017 with senior McKaylie Caesar (Lindsay) defending her title and sophomore Haley Ulloa (Bakersfield Highland) placing second. Caesar ran away with it in 18:16.05. Ulloa, 34 seconds back a year ago, was 1:19.20 back this time. Caesar, who has now won five of seven 5K races this season, ran 5:54 pace. Highland was a three-point winner over Corcoran with Lindsay third, seven points behind the winner, in the team race. Chowchilla's Michael Eggert got the best of defending division champion Garrin Schaap, crossing in 17:05.89. Schaap, a senior from Central Valley Christian, was second in 17:11.14 with teammate Josh Dykstra third in 17:21.24. Matison McCombs (Liberty/Madera Ranchos) won the girls race in 20:08.29 with teammate Sophia Napier second in 20:22.03. McCombs, a senior, crushed her previous best on the 5K State Championship course of 21:01.90, run earlier this year at the Rough Rider Invitational. Defending girls champion Caliska Avila (Washington Union) was fourth in 21.07.03. 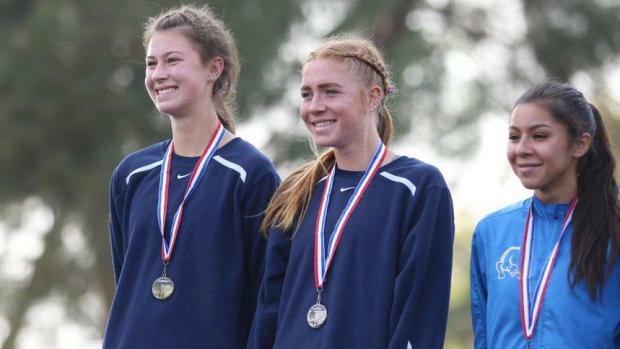 Marianne Gleason (San Joaquin Memorial) was third in 20:46.24 a year after placing second behind Avila.